This entry was posted in Randy's blog entries on February 6, 2019 by randy. Over the 20+ years of the First Friday Book Synopsis, I have presented three books by and/or about legendary business leaders connected with Dallas. The first was The Mary Kay Way by Mary Kay Ash. The second was Uncontainable by Kip Tindell, the recently retired CEO from the Container Store. The third is NUTS! 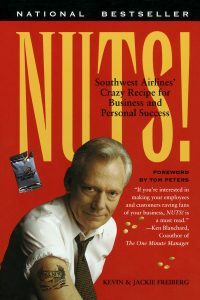 about the leadership of Herb Kelleher and the birth of and culture of Southwest Airlines. All three are worth reading, and this is quite a group of leaders! This past Friday, I presented my synopsis of NUTS! : Southwest Airlines’ Crazy Recipe for Business and Personal Success by Kevin and Jackie Freiberg. They wrote the book back in 1996, and it has stood the test of time. Jim Young, a long-time participant at the First Friday Book Synopsis, recommended the book for February after the death of Herb Kelleher. It was a great recommendation! In my synopsis, I asked What is the point? — Southwest Airlines was just a little bit NUTS! And being just a little bit nuts worked. It may not work for every organization; but it did for this one. And I asked: Why is this book worth our time? #1 – Great CEO leaders are worth studying. Herb Kelleher was such a great leader. This book helps explain his greatness. #2 – Getting the basics right is hard, but always pays rich dividends. This book explains those basics: take care of your people; take care of your customers; don’t live beyond your budget; let people experiment, and even fail… Good reminders for all. #3 – The leadership of Herb Kelleher really did create a lasting culture. This book helps us see the elements of this culture. (From the foreword by Tom Peters): This band of mavericks started a revolution – a revolution whose impact is spreading far beyond the boundaries of the airline industry. In a 1994 cover story, Fortuneasked its readers: “Is Herb Kelleher America’s best CEO?” I believe he may well be. Three extra special things I see: being crazy enough to follow an unorthodox vision, being courageous enough to allow people to have fun and be “real” people who love and care at work, and being smart enough to recognize that their most valuable assets are their people and the culture they create. Southwest never forgets it is in the people business – the company that just happens to operate an airline. Herb Kelleher is always the first to give Southwest employees credit for the company’s tremendous success, and he genuinely believes that leadership is more a function of people relationships than position. There is one fundamental, consistent principle – hire people with the right spirit. Southwest looks for people with other-oriented, outgoing personalities, individuals who become part of an extended family of people who work hard and have fun at the same time. To some politicians and CEOs, it is inconceivable that Herb won’t change his schedule if he has a commitment with Southwest employees. Treat your employees with care and concern if that is the way you want them to treat each other and your customers. The tragedy of our time is that we’ve got it backwards. We’ve learned to love techniques and use people. …like to keep prices at rock bottom? …believe that customers come second? …settle a major legal dispute by arm wrestling? …run recruiting ads that say, “Work at a place where wearing pants is optional”? …paint its $30 million assets to look like killer whales and state flags? …avoid TQM, reengineering, and other trendy management programs? …spend a lot more time planning parties than writing policies? …avoid formal, documented strategic planning? …make the “Lone Ranger” leadership mentality a thing of the past? Well, if being nuts means they are crazy about the company they work for, the answer is a resounding yes! If being nuts means they are extremely enthusiastic about what they do, the answer is again yes! If being nuts means being intensely involved, even obsessed, these people are definitely nuts about providing legendary customer service. ….The people of Southwest Airlines are radicals and revolutionaries – committed to the cause of keeping fares low to make air travel affordable for everyone. In this post, I can’t possible tell the stories that overflow from the book. Stories of concern for and care for employees; stories of concern for and care for passengers; stories of fun – lots of stories of people having fun! 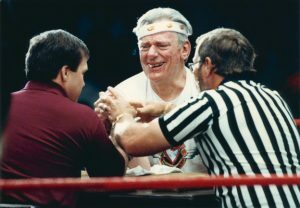 Like the time Herb Kelleher arm wrestled another industry CEO to settle a legal dispute. (One of our attendees on Friday attended the arm wrestling match at the Sportatorium). Or the way Herb allowed people to make decisions for themselves, and settled even very big negotiations, quickly, with a handshake in the hall or a kiss and a dance in the company cafeteria. Herb really was one of a kind! Here was the big, big picture: Southwest made air travel affordable, and accessible, to the masses. They democratized flying. “What they’ve done is create democracy in the airline business.” – “The product we deliver is a wonderful contribution to society. We make it possible for people to fly who could never afford to fly in the past.” (John Denison, EVP, Corporate Services). • Low fares! – From day one, Southwest challenged the assumption that permanently reduced fares would cut revenue. • Southwest perfected systemwide two-tier – peak and off-peak – airline pricing, a pricing structure that eventually reshaped the industry. • define your own targets. Don’t settle for conventional standards; create your own. • keep things simple. Streamline your systems and your life. • at the peak of success, look for things you can do even better. • be humble: success is hardly ever all your own doing and rarely irreversible. • hire people with a sense of humor. • be religious about hiring the right people.If you make the wrong hiring decisions, within the first ninety days make the tough decision to say goodbye. • do whatever it takes. Remember, there is very little traffic in the extra mile. • treat everyone with kindness and equal respect; you never know whom you are talking to. • take on a childlike curiosity. • memorialize and display your fondest memories. • use celebrations to create memories. • market to your employees, not just to your customers. • when it comes to serving others, make sure that “good enough” is never good enough. • show people what legendary service looks like. • make it a practice to give everyone – customers, coworkers, friends, family – more than they expect. #1 – Herb Kelleher was a great leader. He is likely not quite fully “replicable.” But his spirit lives on, and it is a great tribute to the people of Southwest Airlines that the culture he created is still so strong, so deeply rooted, and every-where present. #2 – Have more fun – much, much more fun! ; care for each other; then (and only then) care deeply for your customers. These are the basics. Get the basics right! #3 – It is never easy to succeed. Southwest was nearly dead more than once in the beginning. But, they survived, and part of their strength was born from those struggles. #4 – Communicate the good stories far more frequently. Those good stories build the morale, and the sense of belonging, of the people who make up the organization. Tell those good stories! #5 – Regardless of the “business” of your organization, your real business is customer service. Get that right above all else. And, one way to get that right is to take very good care of your employees, who will then take good care of your customers. I am glad I read this book. It helped me understand that one leader, building a team of leaders that built a great culture, can shape lives for the better, and provide something that so many need in the process. Herb Kelleher and Southwest Airlines made flying available to the masses. That was such a wonderful contribution to modern life!